Have you ever wondered who planted the first grape vine in Washington? Was it the Italian immigrants, German settlers or French fur trappers that roamed the eastern part of the state? Was it in East Wenatchee, Walla Walla or Grapeview? 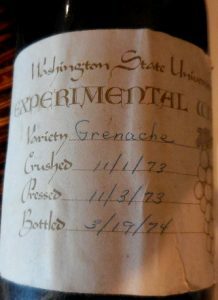 When we opened Grape Expectations in the fall of 1985, there were somewhere in the neighborhood of 40 Washington wineries. Today, some still exist, in one form or another and others are no longer. There are now somewhere in the neighborhood of 980 wineries in Washington and over 600,000 acres planted to vitis vinifera. Two of the most influential wine pioneers in the early 1900s were Dr. Walter Clore and Canadian immigrant, William B. Bridgman, who encouraged the young Dr. Clore to plant grapes in Yakima Valley Research Center in addition to other fruits, vegetables and grains. When W.B., as a young attorney, arrived in Sunnyside, he set up shop, bought some acreage and also played an important role in the development of irrigation laws in the Yakima Valley. As manager of the Sunnyside Irrigation Canal, he authored the guidelines to develop and share water resources. Dr. Clore was an assistant horticulturalist at the Irrigated Agricultural Research and Extension Center just outside of Prosser. Initially, the research center was 200 acres of sagebrush planted to corn, millet, potatoes, wheat and clover. That all changed when vitis vinifera came to town. Sunnyside, where Bridgman settled in, was founded in the late 1890s by some Midwestern folks from the Progressive Brethren Church. They were determined to keep the sins of the world at bay in their new community. Wine may have been ok for Jesus at Cana but not in the backyards of these Sunnyside residents. Sunnysiders survived, for a few years anyway, on the produce of their truck gardens but shipping outside the area was beyond their scope of work. So, they discovered the best way to make money was to sell land to unsuspecting newcomers. W. B.’s arrival in the “holy city” of Sunnyside in 1902 was definitely a blessing the residents weren’t counting on. As his law practice thrived, it allowed him to purchase land. Being from a farming community, farmland was a top priority. He also had viticulture in his background. Back home on the Niagara Peninsula, his family grew Concord grapes. 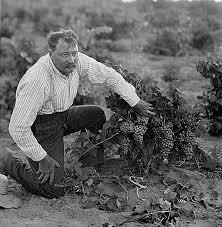 So, in 1917, Mr. Bridgeman planted a vineyard on Snipes Mountain in the Yakima Valley. These were the first commercial wine grapes in a region that has been the center of the Washington wine industry ever since. The place, called Harrison Hill, turned out to be a great place to grow wine grapes. Bridgman became the local celebrity, two-time mayor, and Sunnyside’s biggest promoter. He encouraged the business of farming throughout the valley and the agricultural bounty of the irrigated farmlands. After Prohibition, Bridgman took advantage of the opportunity and opened Upland Winery on Snipes Mountain. In 1934, the winery produced 7,000 gallons of wine from his vineyards planted to a smorgasbord of vinifera grapes. He had 165 acres of Semilion, Pinot Noir, Cabernet, Palomino, Thompson Seedless, Sultana, Black Muscat, Carignane, Zinfandel, and Mataro under contract with more than 70 growers. While he wanted to focus on table wines using European grape varieties, he found most of his success in sweeter fortified wines that were popular in the ’40s and ’50s. Bridgman sold the winery in 1960 and died eight years later. Of all his contributions, one of Bridgman’s greatest achievements was convincing young Dr.Walter Clore at the Washington State University Experimental Station in Prosser that wine grape production was viable in Eastern Washington. Looking back, that was sage advice. Al Newhouse, a second-generation Yakima Valley farmer, purchased Bridgman’s vineyards and expanded the plantings over the years to four hundred acres. His grandson, Todd Newhouse, joined the family business in 1996 and relaunched Upland Estates Winery in 2006. In 2009, the federal government recognized Snipes Mountain as an official American Viticultural Area. At 4,145 acres with over 800 planted to vinifera grapes, it’s small but making a huge impact. And those vines Bridgman planted in 1917? Astonishingly, several of them survive to this day, including Thompson Seedless and Muscat of Alexandria. There is also Black Muscat and Cabernet from the 1950s and ’60s. Newhouse and winemaker Robert Smasne, before he struck out on his own, have made award winning wines from those vineyards. Other winemakers have too. DeLille Cellar’s Harrison Hill and Thurston Wolfe’s Black Muscat were made from Bridgman’s early planting. On a recent trip to Yakima Valley, I became reacquainted with Upland Estates Winery over lunch at the Cowiche Canyon Kitchen and Ice House. The place would have made W. B. smile. It’s a “polished American Tavern” constructed in the fashion of an old fruit warehouse, all concrete and wood décor to reflect Yakima’s agricultural industry. Lighting, walls and flooring are re-purposed materials. With an open kitchen, a wood fired oven, smudge pot and ice block lights, concrete walls ingrained with wood and a steel warehouse door that opens to outside dining, the place has wonderful ambiance with so much to see and enjoy. Which I did with glass of Uplands Sauvignon Blanc and a dish of Ahi Tuna with Mango Salsa. It was a perfect lunch. And while your in Yakima, do stop by the Walter Clore Wine and Culinary Center in Prosser. Named for the Father of the Washington Wine industry, it is a learning center that promotes Washington State wines and foods. You’ll be dazzled when you visit this spacious tasting room, where you can taste wines from across the state and learn about the wide variety of grapes, soils and climates that make our wines so distinctive. Established at the request of wineries and other petitioners, boundaries for the thirteen Washington AVAs are defined by the federal Alcohol and Tobacco Tax and Trade Bureau (TTB). Each month at the Walter Clore Center, one of the 13 AVAs are featured for a month. The decision on the featured AVA is decided by drawing a name out of a hat. You’ll learn to really appreciate the work, quality and diversity of wine and food produced in the state through the Center’s seminars, programs and events. 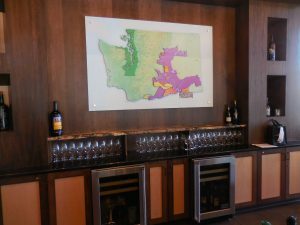 There is even a Legends of Washington Wine Hall of Fame where you may stumble upon who planted the first vineyard and where in Washington State it was planted. With all the hot weather through July and now into August, the harvest season is in fast forward mode. So, I’ve been plotting what to do with all that blackberry bounty.It looks like a record crop of that sweet luscious fruit and for the truly ambitious that means lots of wine, cordials, syrup, sauces and cake. Blackberries, as everyone in Western Washington knows, are sweet, dark-colored berries that can effortlessly become invasive. They are extremely variable, because they freely cross with other blackberries and raspberries. There are many types of blackberries including the erect ones from the eastern United States, the Eastern trailing, Southeastern trailing, and the Pacific Coast trailing types. All of these different parents have crossed and recrossed to produce the many cultivars we have today. And sometimes that’s a good thing, for example, now there are thornless blackberries. Blackberries are known for their flesh slashing thorns and the way they trip you up while walking along the trail. Many love the fruit, but the thorns bring fear and suffering and the seeds get stuck between your teeth causing you to sprint for the floss. But we can forgive them their trespasses because of the luscious goodness they can turn into. First and foremost, blackberry wine. Having judged a number of county fairs over the years, I’ve tasted some very, very good blackberry wines. And I have made my share of blackberry wines. It’s easy, inexpensive and you get to do it your way. You know, the right way. The most important part of fermentation process is to keep anything in contact with your wine, super clean and sterile. Gloves and a pot of boiling water to sterilize equipment are essential. Equipment needed includes a covered fermenting vessel, a small mesh bag to contain the fruit sediment, siphoning hose, airlock, and two carboys. Two, actually, because you’ll need to siphon the wine off the lees after the first 10 – 12 days of fermentation. And this will need to be done at least three of four times to clarify the wine and to prevent it from developing off flavors. You can purchase your yeast, yeast nutrient and Camden tablets from Bill Sproules of Olympic Brewing Supplies in East Bremerton. His store has all the equipment you need to make wonderful blackberry wines. They even have it in a can if you want to skip the picking part. Bill is also an excellent resource for winemakers, new and experienced. He has recipes or you can follow one of the many to be on line. After the picking is over and your wine has been fermented, racked, fermented a second time, bottles and aged for about three to six months, try this recipe for Blackberry Wine Cake. You’ll need a package white cake mix, 3 oz. blackberry flavored gelatin, 4 eggs, 1/2 cup vegetable oil and a cup or your blackberry wine. Mix all ingredients together. Bake in a greased tube pan at 325 degrees for 45 minutes. Prepare a glaze of 1 cup powdered sugar and 1/2 cup of blackberry wine. Pour over cake. Other easy ways to enjoy the bounty of blackberries is to make a cordial. This is super easy. You’ll need equal parts, of vodka, Cognac or brandy, sugar and berries. Put all ingredients into a big jar and cover. Agitate it every now and then until the color is good and the berries have completely macerated about two weeks. Strain and pour into bottles. Seal tightly and store in a cool place for at least 2 weeks. Adding spices to the mix makes it way more interesting. Try a few whole cloves, black peppercorns, cardamom pods, or cinnamon sticks for more complex nuances in your cordial. Besides the quick and easy cordial, another way to enjoy the bright burst of color and taste is blackberry syrup. It can brighten up many dishes. You can splash it into a glass of champagne, drizzle it over waffles, or flavor a sauce for a roasted pork loin. You can muddle it with mint or a myriad of other herbs then top it off with a splash of soda for the ultimate al fresco cocktail. Or transfer it to a bottle, decorate with pretty paper and twine, and voila! A hostess gift! Blackberries also freeze very well. Rinse under cold water. Lay evenly on a baking tray and put in the freezer. When frozen, put them in a plastic bag for later use. There are a few Pacific Northwest wineries that make a delicious blackberry wine. My favorite is Pasek Cellars. Pasek Cellars in Mount Vernon has been making fruit wine for about 20 years. And you may have tasted this too if you have had a bottle of the Bremerton Blackberry Festival wine made by Pasek Cellars. Their fruit wines have garnered quite a few gold medals and include a Blackberry that is vibrant with sun-drenched berry flavors (both dessert and not dessert), Cranberry (perfect with turkey), Loganberry and Raspberry. They also make a unique dessert wine – Arabica, a coffee dessert wine. I’ve had their wines and hand on heart, swear they’re terrific. I may have tried the Wild Vines Blackberry Merlot sometime in the not so distant past. This fruity blend is made in Modesto, California by the largest wine producer in the world. I only mention this because it inspired me to blend last year’s blackberry wine with a Cabernet concentrate I purchase from Bill Sproules at Olympic Brewing Supplies. It’ll be a few months before I can report on this blend. 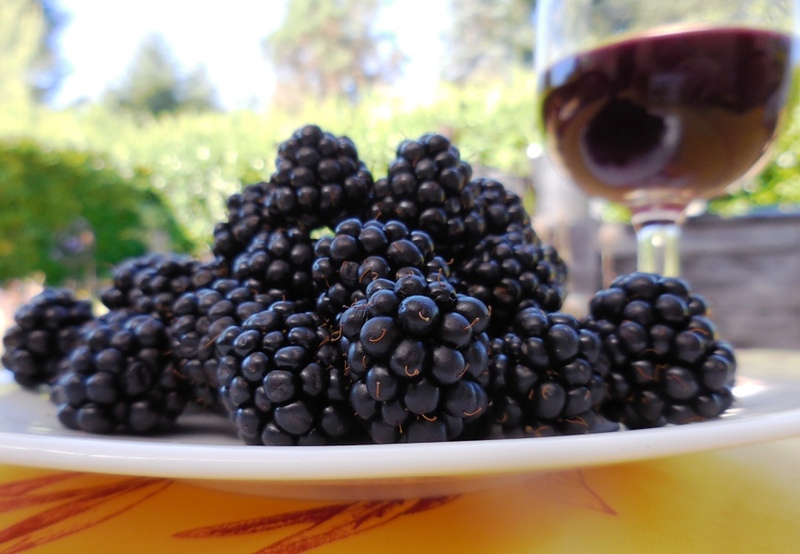 Other Northwest wineries that make blackberry wine are Honeywood, Hoodsport, Nehalem Bay, Northwest Mountain Winery, Sky River Blackberry Mead, Wasson Brothers Winery and Westport Winery. Happy picking! What do you get when you add eight blondes, four brunettes, one bachelorette and wine? My trip to Napa Valley. Yes, my first-ever trip to Napa was for my college friend Courteney’s bachelorette weekend. She made it clear she wanted to be surrounded by her closest friends and wine for her last hurrah, and those who know Courto know she always gets her way. And lets be honest, what wine lover would say no to a trip to California wine country? So the tickets were bought, a house rented in Napa, a limo booked. We arrived Friday and set out early Saturday morning on our wine-tasting adventure. Because of the size of our group, appointments were made ahead of time with three wineries. As I previously noted, we were scheduled to taste at Frog’s Leap, V. Sattui, Alpha Omega and Pina Winery. We hit all these spots, plus one, on Saturday. I’ll write about each stop, the wines we tried, and my overall impressions. We also ventured to Sonoma on Sunday to kill time before our flight. Those of you who recommended Sonoma over Napa were definitely on the mark. I felt downtown Sonoma fit my preconceptions of what I’d experience while there. We also stumbled into a tasting room while we were there. The wines were superb — in fact I think they were better than most we tried the day before in Napa. (More on that later). My other observation has to do with the Cabernet Sauvignons we tried. Many were blended with other varietals and almost all that I tried left my mouth dry on the finish — like bone dry. This really surprised me. I can’t say why I was left with a dry finish. Maybe it was the style in which they were made? Or because the terroir is different from the Washington growing regions, which results in a different wine? Regardless, that’s what I took away from my tastings: the Napa Cabs are dry. They were delicious, don’t get me wrong, but they were dry. To start, let me say I loved everything about this winery. While the weather was downright cold, we were still able to imagine spending a hot summer day sipping wine on the deck overlooking the winery’s lush gardens with the vineyards in the distance. They’ve created an ambiance reminiscent of a cozy house, where when you walk in, you instantly feel like making yourself at home. (Sidenote, no one lives at the winery except for the cat). The wines match that “sit, sip, stay a while” impression, making you second-guess your decision to leave for another winery when it comes time to go. We were given the star treatment while we were there, which also made our experience that much more enjoyable — it helps that one of our bachelorette attendees was the sister-in-law of a winery employee. 2009 Frog’s Leap Chardonnay (Napa): One-third of this wine was aged in stainless steel tanks, while the rest was kept in neutral oak. This resulted in a Chardonnay that had no oak tones (and subsequently no butter on the finish). It did however have a strong citrus impression, which was noticeable immediately on the nose. This Chardonnay is described by the winery as having a “mineral-and-slate essence” which I would say is correct. Everything about the wine is cold, which makes it a good choice to drink while trying to cool off on a hot day. The finish is described as “clean” by winemaker John Williams, and I’d have to agree100 percent. I found the finish tart, leaving my mouth to pucker ever so slightly, reminding me green apples. 2008 Frog’s Leap Merlot (Ruhterford): This wine was released two months ago, and grown on site at the winery. The nose reminded me instantly of oak, because of the hints of sweetness that were quickly followed by full-bodied fruit aromas. This is a wine that instantaneously fills your nostrils and your mouth. My first taste sent me to a state of relaxation. Flavors of cherry and plum produce a jammyness upfront, but don’t let that fool you into thinking this wine doesn’t have anything to offer after that. It leaves your mouth full and the finish is smooth, leaving you wanting more. (It left me eager to buy a bottle, which I did). 2007 Frog’s Leap ‘Rutherford’: This is the winery’s premium Cabernet. It’s a blend between Cabernet Sauvignon and Cab Franc. We were told this wine would have notes of the Rutherford AVA’s “classic dust” and boy they weren’t kidding. After sticking my nose in the glass, all I could smell was the dust. It actually reminded me of the smell a wineglass gets after being inside a stuffy china cabinet for a month or two without use. I liked this wine, but found the finish dry (see my above observation about the dryness of the Cabs we tried). I was surprised by this because of the oak on the nose — guess I assumed the finish would be fuller. I was wrong. 2010 Frog’s Leap La Grenouille Rougante: This Rose was a crowd favorite with its dry finish that had just a spritz at the end. 2008 Frog’s Leap Zinfandel (Napa): This wine had a good nose with hints of spice. The flavor balanced spice with its upfront jammy hints. 2008 Frog’s Leap Cabernet Sauvignon (Napa): This is a blend of Cabernet Sauvignon, Cab Franc and Merlot. This was preferred to the Rutherford Cab. I found it too had a dry finish. Crowd favorites: I preferred the Merlot, as did our bachelorette; the Rutherford Cab was labeled “best experience” by Kelly, our expert Cab drinker; while Alexa (our beef jerky connoisseur) opted to label the Zin her favorite. Carly was so wowed by the Rose that she bought a bottle — at $14 it was hard to pass up. With some time to kill before our next stop we used the “two-for-one” tasting cards given to us by Frog’s Leap to visit Grgich Hills Estate. We tried his 2008 Chardonnay, 2009 Fume Blanc (aka Sauvignon Blanc), 2007 Zinfandel, 2006 Merlot and 2007 Cabernet Sauvignon. All of these are estate grown in Napa. The Chard was another without malolactic fermentation, so there was more citrus than oak up front. Our pourer told us Mr. Grgich has been making his Chard this way since the 1970s, making him unique in the region — at least at the time (again see above for my conspiracy theory that there is a small rebellion brewing among California winemakers to create non-oaky Chards). The Zin had a fruity nose — definitely smelled strawberries on this one — which surprised me and reminded me more of a Burgundy than a Zin. I traditionally think of Zin’s as a heavier wine that can stand up to strong dishes (think Chili, BBQ, something with a lot of spice). This one however came across much lighter. Lastly the Cab underwhelmed me. The nose was minimal and the finish was almost nonexistent. Our next stop was V. Sattui. The primary goal on this trip: Food. We didn’t try wines here, and frankly I’m glad. The place was a zoo. Think Disneyland for adults. The lines at the bathroom were long, the picnic grounds crowded and the tasting rooms packed. This is another winery with great scenery. 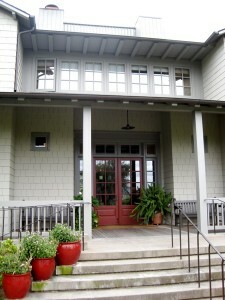 The tasting room overlooks a patio area with a fountain spouting from the vineyards out front. If it’d been warm we would have enjoyed a glass out there, but alas we stayed indoors — where it was also a little chilly. 2010 Sauvignon Blanc (Napa): This grape is estate grown. It was crisp with sharp citrus notes. Because of its clean finish, I imagined enjoying this on a hot day, or with raw oysters bathing in a vinegar shallot marinade. The winemaker describes flavors of banana, pineapple and vanilla balanced by crushed stone, white peach and melon. Can’t say I tasted any of those (it has been a while since I last ate crushed stone after all), but the wine reminded me of a crisp white Bordeaux blend. (This makes sense because winemaker Jean Hoefliger, a Switzerland native, spent time in Bordeaux). 2010 Chardonnay: This was yet another unoaked Chardonnay. Fermented in stainless steel for six months, this wine was focused on its citrus flavors. 2010 Rose (Napa): The first thing I noticed about this wine was its deep color. We later learned the juice spent 24 hours on the skins, which is why the color was richer than the light pink Roses we’ve come to expect. The blend was 60 percent Cabernet Sauvignon, 16 percent Merlot and the rest a blend between Cab Franc and Petite Verdot. I would describe this as a dry Rose, that offers something more for those who think they don’t like Roses. I have to include the winery’s description of the wine because to me they listed everything but the kitchen sink for what you might taste in your glass. Drinkers of this wine might notice on the nose: “touches of milk chocolate and white chocolate with cherry, rose, strawberry, yogurt and basil.” (Really yogurt and basil?) On the palate you could expect a “fresh entrance with an evolution into citrus, cedar, grenadine and cherry syrup lingering on fresh lemon zest and grapefruit.” Hmmm. 2007 Proprietary Red (Napa): This is a Bordeaux blend of 50 percent Merlot, 39 percent Cabernet Sauvignon, 7 percent Cab Franc and 4 percent Petite Verdot. The grapes were sourced from different vineyards, including Stagecoach. I noticed hints of oak on the palate and nose — but couldn’t discern the “chalk” I was told I should be able to smell. (To be honest, I’m not sure I even remember what chalk smells like. It has been a while since I was in elementary school). 2008 Cabernet Sauvignon (Napa): Our last wine was the Cab, which was a blend of 75 percent Cabernet Sauvignon, 16 percent Merlot and Cab Franc and Petite Verdot. The grapes were sourced from Stagecoach and To Kalon vineyards — two historically well-known vineyards in Napa. This Cab had the same dry finish I noticed with the other Cabs. This was the crowd favorite of our group. 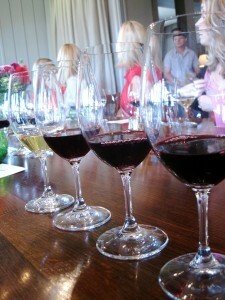 Overall the wines at Alpha Omega were well-made and interesting, which left me wanting to try them again. However for the price points — the Cab and Proprietary Red were $84 and $86 respectively — I’m not sure if I’d go so far as to buy them. We also got a few good laughs out of the descriptions for the wine (you may have noticed my poking fun at them), in part because they used descriptions of things we’d never taste or eat (i.e. crushed stone and chalk). Our last stop of the day was Pina Winery. Even though we called in advance and scheduled an appointment, Clare, the only employee on hand, was not expecting us. You can only imagine his surprise when 12 women and a baby (the bride’s twin sister Kyle had her beautiful 9-week old daughter Ellie along) burst into the quiet tasting room, which also doubles as the cellar and stockroom. While he was a little rough at first, we finally won Clare over after he learned most of us were fellow University of Washington alumni. 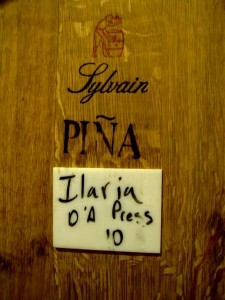 Pina is a small-scale winery, only producing 2,000 cases a year. 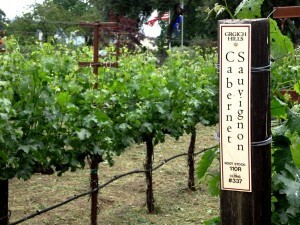 Their wines are largely available online, through the wine club or for purchase from the winery. You’re probably not going to find them in the grocery store or wine shop. 2008 Cahoots: This Cab has 5 percent Syrah, which I felt lent a slight jammyness to the finish, making it less dry than the other Cabs we’d tried. I really enjoyed this wine because of the hints of fruit, and the lingering rich mouthfeel. The wine exhibits black cherry, crème de cassis, graphite and forest floor, according to the winery’s description. (We liked this one so much, we bought five bottles). 2007 D’Adamo: This Cab is named after the vineyard where the grapes are sourced — D’Adamo. The Pina family leased the land and planted the vineyard in 1982. One of the four brothers that currently run the winery manages the vineyard, which he juggles with his day job as a tire salesman, according to Clare. With 15.4 percent alcohol by volume, you can imagine this wine had very dry finish. Aromas of black cherry, huckleberry and mocha were noticeable. The winery’s description says “sweet ripe fruit” will coat the palate and layers of oak and vanilla will follow. I don’t recall that experience — instead I felt the wine was a bit tannic. However with time I’m guessing the oak flavors will step up and the tannins will subside. This would definitely be a wine that would benefit from some time in the cellar. 2007 Howell Mountain: This wine is sourced from the Buckeye Vineyard on Howell Mountain in Napa. It spent 20 months on 100 percent French oak, 73 percent of it new. I quickly detected the famous Rutherford dust on the nose again and in the finish. (Sidenote: the grapes from this vineyard are pretty pricey, $10,000 a ton, according to Clare). 2008 Stone Corral Vineyard: This special bonus pour was in honor of our bachelorette. It was smooth and tasty, and honestly because it was the last wine of the day, I don’t remember a whole lot about what it did to my mouth — I did however drink all of it, which was the first time all day I allowed myself more than a single sip without spitting. A quick last thought on our Sunday visit to Sonoma. 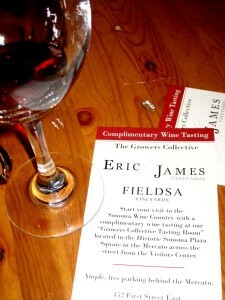 We visited the tasting room of Eric James Vineyards. It’s a small production winery — only 800 cases a year. We loved all of the wines we tried here — I’d put them up there with Frog’s Leap for my favorite wines of the weekend. We tasted a 2009 Chardonnay, which was by far my favorite Chard of the weekend (and yes it too had minimal oak). It reminded me of a white Burgundy, with a perfect balance of citrus and floral notes. Next we had a 2010 Syrah Rose — also my favorite Rose of the weekend — which was dry but with a slight sweet note, and a 2007 Pinot Noir, the weekend’s first. The bouquet on the Pinot was striking and the finish lived up to the expectations of the nose. All of the wines are around 14 percent alcohol by volume and made to pair well with food. Because I purchased two bottles the day before and had already packed my suitcase by the time we visited Sonoma, I didn’t buy anything. However I wished I had. The Chardonnay and Pinot are still on my mind. Sounds like another trip is in order. I think everyone can relate to the story I’m about to share. It has to do with pretentiousness that surrounds wine from time-to-time, and the people who ruin wine as they pontificate their wine know-how to perfect strangers. 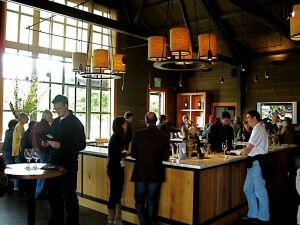 Saturday we visited three of the Bainbridge Island wineries for the “Meet the Winemakers” weekend. (I’ll go into the wines we tried in a separate post). There were a number of people making the circuit, so while we had some good one-on-one time with the winemakers, there were times when we had to share their attention. It was at one of the more crowded stops that Jeff (my husband) and I encountered a person who, in my opinion, may have had one taste too many. She wasn’t rude; in fact she was the opposite — friendly and conversational. But, the wine know-it-all immediately started name dropping the Bainbridge winemakers, telling us their wines sell themselves, they produce some of the best wine in the state, etc., etc. I appreciated her enthusiasm, and agree there are some great wines coming from the island, but the more she talked, the more she got the facts wrong. Now I don’t pretend to be a wine expert, but I do know the basics. Including the fact that except for Gerard and Jo Ann Bentryn, red wines made on the island come from grapes grown in Eastern Washington. (The Bentryns grow pinot noir at their Day Road vineyard). Mind you, the label of the wine she was drinking specifically said it was from Kiona’s Red Mountain Vineyard, which is located near the Tri-Cities. Clearly our new wine friend was trying to show that she knows how terroir plays into wine. But if she knew enough to know about terroir, she should also know Bainbridge’s reds — except for the Bentryn’s Pinot — come from Eastern Washington. Instead I kept my mouth shut, smiled politely and poured out the Sangio to wait for the next red. She however took this as a dismissal of the wine she described as “smooth, rich and the best she’d had.” (I liked the wine, but as a 100 percent Sangiovese, the tannins and acidity were present on the finish, which did not leave me thinking “smooth”). Let me end this post with some advice. If you’re at a tasting, pace yourself. Don’t feel bad pouring out after a sip or two, or spitting. Winemakers won’t be insulted. In fact, they’re more likely to get insulted when it appears you’re drinking for the buzz and not to appreciate the hard work they put in to making it. I know I’m not the only one who has a story about a run-in with a pretentious wine drinker. If you can, please share your stories so we can all chuckle — and remind ourselves not to get caught up in how much we know about wine. While dining at a newly opened restaurant on the other side of the water, my husband and I (along with a group of friends) experienced an over-eager server whose enthusiasm spilled over into everything she did — including our wine. I won’t name the restaurant because I don’t want to deter anyone from going there, but the experience left everyone in our party talking about the fact that our young server didn’t realize the etiquette of the perfect pour. (This led my husband to suggest we address wine pouring on the blog). A group of 10 of us got together in January to meet a friend’s fiancée for the first time. We decided the best bet for our money would be to order wine by the bottle. Each couple would buy one bottle as the one we were drinking ran out. The problem was, the server would pour about half of the bottle in one glass, instead of making it last between four glasses. While smart for her employer — hey if we drink the wine quicker we have to buy more, right? — it left us feeling like we were never going to see the bottom of our glasses. One friend joked our server had just turned 21 so she was probably pouring like she would for herself — almost to the top of the glass. But pouring a wine to the top prohibits swirling to get the full bouquet, and in my opinion takes away part of the enjoyment of drinking wine. I mentioned to Mary the wine drama we experienced at dinner (our server also refilled my friend’s glass that still had Malbec in it with Rioja) and asked her if there was a “wine pouring protocol” that people should follow. Following protocol with friends may get you the raised eyebrow but it’s good for everyone to know how to serve wine. Here are some steps to follow to pour each glass like a professional. Wine should be ready to go, meaning chill the white and sparkling wines; reds should be around 60 degrees. Temperature impacts a wine’s flavor. Chilled wine masks some imperfections — good for young or inexpensive white wines. However, a chilled red will accentuate the harsh tannins. If serving an old bottle of wine, stand it up for a day to let the sediment fall to the bottom. Everyone has a favorite glass shape. (Check out our post for further details on finding the perfect wine glass). With the appropriate glass picked out, make sure it’s clean – if it smells like the cupboards, or soap used after its last rinse, try air cleaning. Stand clear of counters, tables, chairs, etc. and dramatically ring the glass like a bell, throwing your arm up and down in the air. If that doesn’t do the trick, rinse it thoroughly with water. If serving an older wine keep it upright and don’t jiggle it too much — remember sediment is on the bottom. Decant the wine by pouring it into a container. The wider the opening of the container, the easier it is for air to reach the wine. (This is good if the wine is young and tight, but not so good if the wine is old). Decanting improves flavor of tight wines, because more air goes into the wine as you pour. (Remember to be gentle on the older wines). Leave each wine glass on the table. Pour toward the center of the glass, and fill it just under half way. Give the bottle a half twist at the end of the pour to prevent dripping. Face the label toward guests so they see what they’re drinking. Serve women and older guests first, then men and end with yourself. Never fill the glass to the brim or the wine police will be notified. With the glass just about half full, you have room to swirl. Swirling aerates the wine. With base of the wine glass firmly on the table, make little circles. If the glass is too full you’ll make a mess, so while you might want to devour the wine right away, less is better in this case. Stick your nose in the glass and breathe in with your lips slightly parted — you pick up the scents better that way. After enjoying the aroma, take a small taste — put your chin to your chest and try sucking air in through your lips with the wine in your mouth. 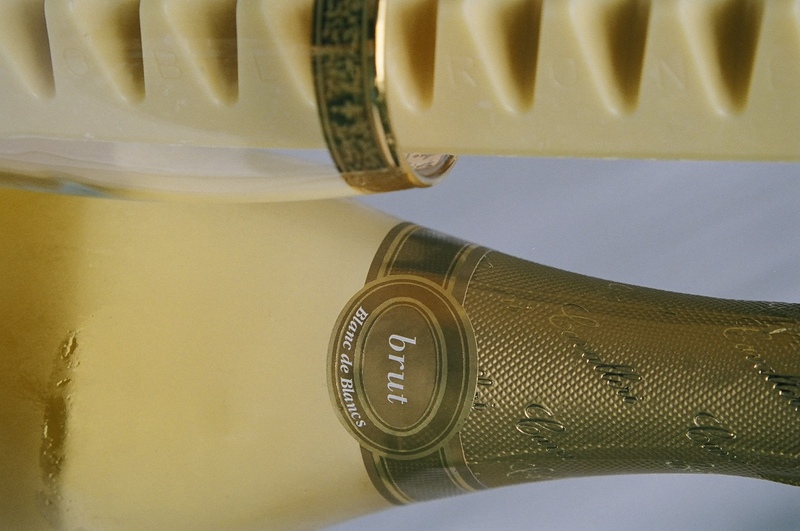 It helps aerate the wine, and gives you more flavors. When’s the best time to drink wine? In a recent “What we’re drinking” post, Brynn talked about the Novelty Hill Red wine that she enjoyed at a friend’s house. Later, she snagged a bottle of the same wine, but it didn’t wow her like it had before. Have you ever had a glass of wine and not finished the bottle? OK, maybe several bottles were opened and you drained one that was fantastic and the other was put to the side. And then came back to it a few days later and it too was fantastic? Back to that unfinished bottle: Which glass of wine was better? The freshly opened glass? Or the dregs of the bottle? There is no right or wrong answer; it’s just another piece to the what-you-want-in-a-wine-puzzle. Some palates prefer the fresh fruity, bright flavors of the younger wines. Others prefer a more intense fragrance, and smoother taste of the aged wine. You make the call. Back when the British ruled the waves, most red wines were made in a style that mandated laying it down for a decade or two. Fast-forward to the past fifteen years or so and the winemaking styles have changed to keep up with demand. I attribute the change to the wine cooler hay day. Wine coolers in my mind are a wine with training wheels. And it’s a drink-me-now kind of wine because all the chips are stacked in the fruit department. More and more people were drinking more and more wine. 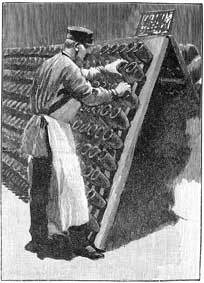 Laying down a wine was not as important as it had been and wineries began pumping out wine to be drunk in the near term. But always on the other end of the spectrum will be aged wine. This wine’s flower of youth has faded and what’s left falls more on the mineral spectrum of the tasting wheel. Flavors like pencil lead, cedar, tobacco, gravel and mushrooms will be the highlight of these wines. Some wines are meant to be kept a few years, others drunk right away. If you prefer the fruity, crisp, oaky wines, stick to drinking vintage. If you want to give wine time to mature, think about buying two bottles — one for now and one to lay down for a year or two to see how it changes with age (just remember to save your notes from the first time you drank it). It was Colonel Mustard in the cellar with a wine bottle. He was perusing labels, trying to determine which wine to decant for his dinner party at eight. Peking duck was the entrée. The cook, Mrs. White, had hung the duck with a rope near the stove to cure it for the required 48 hours. It was a dish he had enjoyed many times in the Far East. Ah, but duck is a dense red meat. He needed wine with some heft to it, not too strong, but with infinite balance. And it had to be red, even if it was fowl. He picked up a bottle to read the label: Los Bravos Mendoza Malbec 2009. An Argentinean wine harvested in March 2009, the Malbec was a young wine made in the new world style, meaning it would have quite a bit of fruit up front. 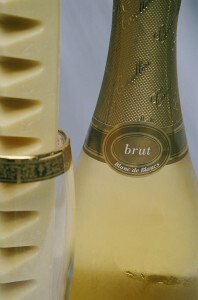 The alcohol level was nicely balanced at 13.5 percent, making the wine not too hot and not sweet. The Colonel stood there looking from the Malbec to the Barbera d’Alba. The Barbera, from the Alba region in northwestern Italy, was also young and being mountain grown, had plenty of acidity to stand up to the duck. However, the label said 14.5 percent alcohol. This is a wine that could pack a wallop. He put the bottles down and picked up a bottle of Bordeaux. With a decent alcohol level of 13 percent, was too old for the dish — there wasn’t enough fruit left in that left bank Cabernet to balance the richness of the duck. Remembering the timeless adage: “Old before young; white before red” and most importantly “dry before sweet”, he rummaged around in the white bins. Preceding the duck was a little bit of sole, a simple white fish. A Sardinian Vermentino, light and crisp, or a German Riesling in the Kabinett style from Berkasteler — not a really sweet one he could tell from the alcohol level. At 12 percent, the yeast had converted most of the fruit sugars to alcohol. The New Zealand Sauvignon Blanc from Marlborough was a bit too strong in flavor for the delicate sole. The 5-year-old Chablis caught his eye. Made from the Chardonnay grape and grown in limestone soil in northern France’s Burgundy region, the Colonel decided it was a great match. Oak is used sparingly and the alcohol is in the right parameters – 13.5 percent. It’s crisp yet silky; has perfectly balanced acidity, alcohol and fruit. And Chardonnay was the favorite grape of Miss Scarlett. That settled he went back to the red labels. The California Zinfandel always has a fantastic quantity of fruit, but the alcohol level on the Turley was 16.9 percent! Even though it was a favorite of Professor Plum, it could be a bit hot for the duck. Lastly his eyes settled on a Washington State Syrah from a winery in Walla Walla. The grapes were harvested from Sagemoor Vineyards, one of the oldest vineyards in the Columbia Valley. A very nice pedigree. A few years of age, and not too over the top with the alcohol, according to the label. “I say, this could be the one,” he said out loud. The pleasure of a port, a mature, vintage port after the meal would be an outstanding culmination to the dinner, he thought. This sumptuous, mellow fortified wine’s quality is due in part to the quality of the brandy used to kill the yeast before it converts all the sugar from the grapes into alcohol. The yeast just can’t live in such an environment. This arrest of fermentation, that leaves unfermented sugars in the wine, is the answer to port’s sweet, high alcoholic (20 percent) flavors. It would be best enjoyed with the saltiness of the Double Gloucester and toasted walnuts Miss White would serve after dinner. Since a vintage port is made only in the best of years, anything with a year on it would do nicely. The Reverend Mr. Green was particularly fond of the 1997 vintage, so the Colonel picked up a Dow’s and smiled in anticipation of the night’s festivities. (Want more clues? Return to “Cheers to You” tomorrow).